I’m trying to create a Routing Index (.rtg) file. My road data is in an SQL Server database, and I’m building a Feature Layer manually by individually adding features (from the SQL data) to an InMemoryFeatureLayer (see code below). What Object hasn’t been initialized? Thanks for your post, but this exception is not clear, is that possible that you can save your feature source to a shape file and sent to us, we can make a test on it. If it's too big, you can send to forumsupport@thinkgeo.com. Can you tell me how to save a featuresource to a shape file? I only have SQL Server 2008R2, not Esri or any other geo tool. 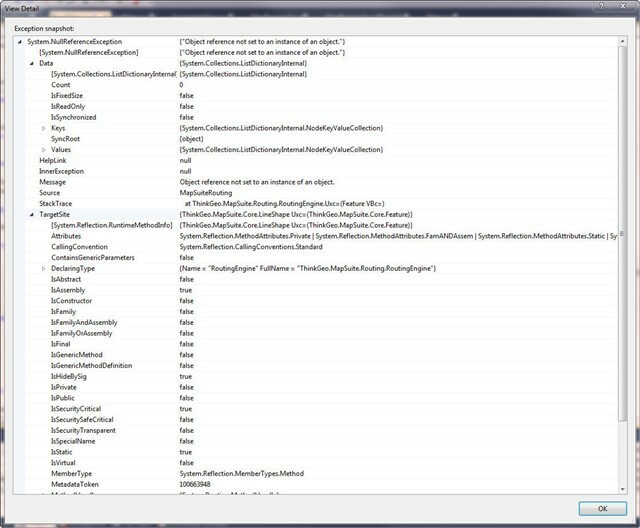 Do you have all exeptions set to 'Thrown' within Visual Studio - Debug - Exceptions? Depending on the exception you maybe able to get something more descriptive with these set to 'Thrown'. I hope this may shed some light... THANKS!! The first thing I notice about your InMemoryFeatureSource is that you do not have any Columns defined. I would recommend looping through all the columns in your LineShape and adding those columns to your InMemoryFeatureSource. Also can you click on the 'View Detail' link within the exception, sometimes there is a StackTrace or an InternalException? Here is the picture of "View Detail" of the exception...if you need to see more just let me know. Object reference not set to an instance of an object is a c# general exception, I can't find out the root cause by this. sf.FeatureSource.AddFeature(featureSource)//loop your featureSource and add each on into sf. After we got the shapefile, we can make test on it, once we can debug and recreate the problem, it will be fast to resolve this problem. Run Query on Database to extract road data—GetRoadLayer() (see example attached). Parse each row into Features, Define the Columns Collection, then attempt to Create the ShapeFile. After running this, I get essentially a “blank” shape file (see files attached). Thanks for your code. I am not sure this the entire issue, but the following might help. In your SetupFeature() method your final foreach loops through your MapTable.Columns and adds a (Column,ColumnValue) pair to the Feature for each MapTable.Column. In this way you are getting all the column data for your feature. In your SetupFeature() method you define a column (at the Feature level) that matches a column found in your Table. Thus each individual Feature has a set of columns that matches the columns in the Table. The mwMapLayer however does not have have the same set of columns. So while each of your Features does have column data, your InMemoryFeature Layer does not have any columns defined in its .Columns Collection. You need to add column definitions to your mwMapLayer so its columns collection matches that of your Table. 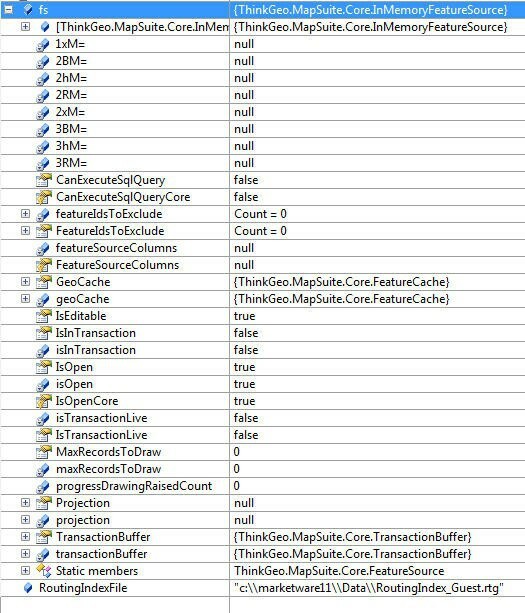 This can be achieved by simply looping through your Table columns and adding a column using mwMapLayer.Columns.Add(). if it would be helpful to resolve this problem I'd be happy to supply a small database (you'd need to have SQL Server 2008R2). Please let me know if this can help to solve this issue... I'd like you to be able to replicate this issue completely. This is an option, but we need to start a Customer Portal ticket as this is getting much more involved. If you can supply a sample application that access a sample database in a Customer Portal Ticket we could set this up to try and recreate it. Understood, I will look for your Ticket.